"My YA novel, Gringolandia, had an unusual and powerful cover closely connected to the story, and I was heavily involved in the design process. A small press published the novel, and in general, small presses do give authors far greater input than large corporate publishers. Thus, when I signed the contract for Rogue, I knew I’d get a chance to see the cover beforehand but I’d have little or no role in the ultimate decision-making. "That said, the result exceeded my wildest expectations. My wonderful editor, Nancy Paulsen at Penguin, commissioned Marikka Tamura, whose work has appeared in The New Yorker and other prestigious venues. 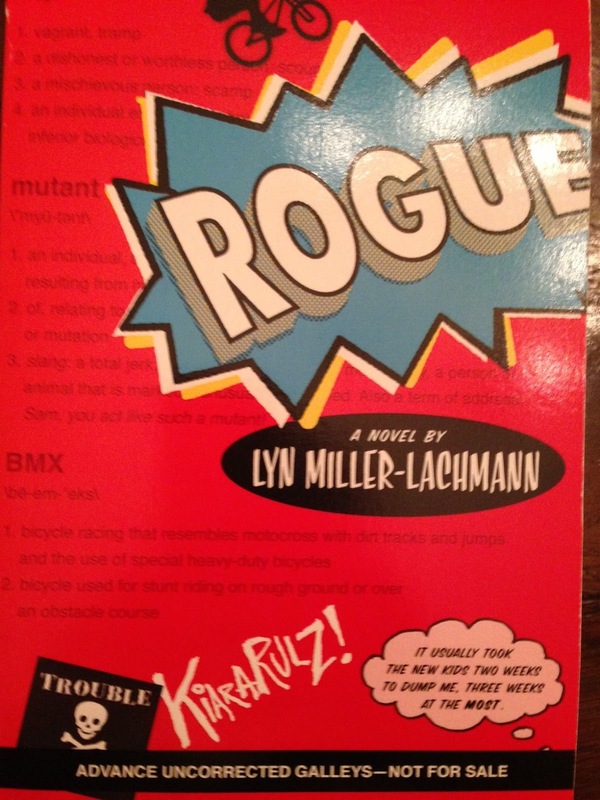 We all agreed that the cover of Rogue needed a bicycle, because bicycles of all kinds play an important role in the story. Once we decided on the title of 'Rogue,' after the X-Men superhero with whom my main character, Kiara, is obsessed, we all knew the cover needed a comic-book superhero motif. "When I first saw the cover design, the only thing that concerned me was the thought bubble that contained the novel’s first line: 'It usually took the new kids two weeks to dump me, three weeks at the most.' The reason is that when I was in school, I used to descend on the new kids, to make them my friends before the more popular kids stole them away. It never worked, and my own friendships never lasted more than a few weeks. So I was nervous about advertising unpopularity—Kiara’s and mine—on the cover. "My editor did not agree with me. The one change that the publisher made from the galley to the finished copy was to change the thought bubble from pink to blue (see galley cover on the right). And here’s where we did have outside input—not mine, but my seventh grade student’s recommendation. "When I told my seventh graders that my novel had been accepted, under the title KIARA RULES, and read them the first chapter, a student named Dan said, 'This is the kind of book I’d read, but not if it has a girl’s name in the title and pink on the cover.' So KIARA RULES became ROGUE, but the graffiti 'Kiara Rulz' on the cover recognizes the earlier title and Kiara’s generally fruitless efforts to be 'cool' and in control. And, of course, the pink thought bubble became a blue thought bubble. 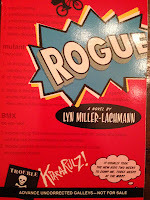 That was a good move because it turns out that boys do enjoy reading Rogue. It’s rare to have boys pick up a novel with a girl protagonist—The Hunger Games is a notable exception—so I’m thrilled that Rogue is in that company. At the same time, Kiara, like Katniss, doesn’t take on traditional gender roles, and every other character is a boy. Like many girls with Asperger’s syndrome, myself included, Kiara’s first real friends turn out to be boys rather than girls. "The gender-neutral cover captures perfectly my main character, her tendency to get in trouble even though she wants to be good, her sense of being an outsider, and her superhero obsession as she struggles to find her own special power. It’s also an lively cover that hints at the outdoors setting and the action and suspense that should keep the pages turning." Thanks, Lyn! I love the idea that seventh graders weighed in here and got a voice at the table! Can't wait to read it!